Fresh Tracks participants representing Pacific Coast communities from Los Angeles to Seattle gather on the final day of the West Coast Training in Long Beach. Over the weekend of July 13-15, a diverse cohort of young adults from urban, rural, and tribal communities located all over the Pacific Coast came together on the campus of California State University, Long Beach for three days of cultural sharing, leadership development, and outdoor exploration. This was the second Fresh Tracks experience of the summer, following the Northeast training outside of Boston in early June. Already this year, Fresh Tracks has given more than 70 young adults a platform to expand their leadership skills. And we’re recruiting more young leaders for upcoming programs in the Midwest (August) and Southwest (September)! None of this would be possible without the generosity of our sponsors - Walmart Foundation, REI, Casey Family Programs, and the Newman’s Own Foundation - who are investing in the next generation of leaders. We are also grateful to our partners - the Children & Nature Network’s Natural Leaders, the My Brother’s Keeper Alliance at the Obama Foundation, and Opportunity Youth United - who collectively provide essential support on programming, recruiting, and strategy. Fresh Tracks would also like to thank our guest speakers: Jean Lim Flores from REI, Judge Deborah Sanchez, Tribal Councilman Vincent Holguin, and Dr. Sharoni Little, Fresh Tracks Evaluator, CEO of The Strategist Company, and Professor at the USC Marshall School of Business. Thank you also to Carl Carranza of the Cabrillo Marine Aquarium for welcoming Fresh Tracks to Cabrillo Beach. Fresh Tracks participants bonding outdoors at Cabrillo Beach in San Pedro, California. After two years of programming, Fresh Tracks remains committed to its core outcomes of cultural competency, civic engagement, and leadership development. Each training brings together young leaders from diverse cultural communities, creating a powerful forum for an exchange of ideas and solutions to drive positive social change in communities across the United States. We also continue to use the outdoors as a platform to forge bonds, build trust, and empower leaders, from the Atlantic Coast of Massachusetts to Cabrillo Beach in San Pedro, California, where the most recent cohort of Fresh Tracks participants explored the local natural surroundings with educators from the Cabrillo Marine Aquarium. And, we stay true to our promise to be there for participants beyond the training. As long as Fresh Tracks leaders want to move forward with their dreams of community action, we will be there to support them. Fresh Tracks Trainer Cameron Williamson Martin of Los Angeles prepares to lead a workshop on developing Leadership IQ and discovering personal leadership styles. Cameron (Cam) Williamson-Martin, from Los Angeles, is living proof of the Fresh Tracks promise. Cam was a participant on the Fresh Tracks pilot expedition in 2016. The opportunities and challenges he experienced during that two-week trip were transformative. Less than a year later, Cam completed a training to become a Fresh Tracks leader. This weekend, he was a core member of the leadership team for the West Coast training in Long Beach, mentoring other young adults just beginning their own Fresh Tracks journeys, leading workshops on Leadership IQ and Community Engagement, and helping to identify the next corps of Fresh Tracks leaders. For a Fresh Tracks leader, preparing for a lifetime of impact starts with knowing your own story. The importance of personal narrative was a theme throughout the West Coast Training at Long Beach, and the focus of a workshop led by Fresh Tracks trainers Luz Alejos and Christie Wildcat. The participants also explored how personal narrative is often rooted in their own pasts. Judge Deborah Sanchez, a guest speaker, spoke about how she inherited her dedication to community service from her Chumash, O’odham and Raramuri ancestors. In a moving Culture Share, many of the participants used poetry, song, and storytelling to illustrate how their personal narratives and cultures are tied into their advocacy efforts. Judge Deborah Sanchez offered a blessing and acknowledgement of original inhabitants and shared how her community service is rooted in her cultural heritage. Culture is a part of how we see ourselves, and how we see others. That was one of the lessons imparted in a powerful session on implicit bias led by Dr. Sharoni Little, Evaluator for Fresh Tracks, CEO of The Strategist Company, and a professor at the USC Marshall School of Business. Pointing to examples from popular culture and her own life, Dr. Little gave the participants new skills to acknowledge and disrupt implicit bias - to avoid determining a person’s abilities based on how they look. Throughout the West Coast training, the participants worked in Action Teams to develop community action plans. Action plans are facilitated road maps for turning their aspirations for change into real action. Jean Lim Flores tries on a Fresh Tracks hat after talking about inspiring others to love the outdoors through her career with REI in Los Angeles. During the training, the participants also had the opportunity to meet two special guests who have leveraged their aspirations for community impact into careers. On Saturday morning, Jean Lim Flores, Outdoor Programs and Outreach Market Coordinator for REI in Los Angeles, shared how she combined her personal and professional passions by inspiring others to love the outdoors. On Sunday, Vincent Holguin, Tribal Councilman for the Gabrielino-Tongva Tribe, described his own career path, his decision to go to law school, and his belief that true change often requires a change in leadership. The Fresh Tracks experience does not end when participants go home. That important note was stressed as a call to action for everyone present. 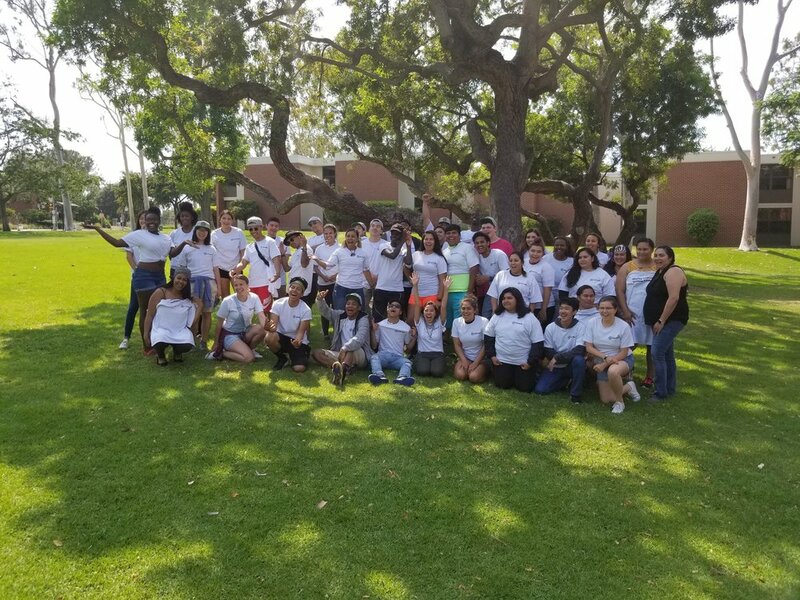 The young leaders who completed the West Coast training departed with new skills and awareness, a network of like-minded peers from cultural communities in several states, and a platform of support offered by Fresh Tracks. The contributions of time, funding, and expertise made by our partners and supporters are investments in these young leaders and their determination to change the trajectory of their lives and their communities forever. Newer PostFresh Tracks is Coming to Indiana!